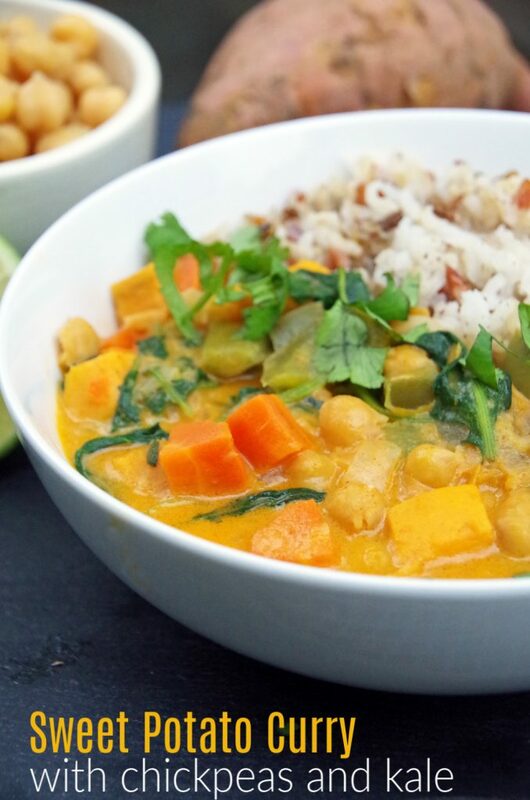 This hearty sweet potato chickpea curry recipe was a big hit for dinner last night. Loaded with chickpeas for protein as well as plenty of veggies, it is served over rice for a vegan dinner recipe that really fills you up. So, what exactly is curry? Traditionally, curry is a meal of meat, vegetables, etc., that are cooked in an Indian style sauce flavored with strong spices and typically served with rice. It generally contains Indian spices like ground turmeric, cumin, coriander, ginger, and fresh or dried chilies. This particular sweet potato chickpea curry recipe uses a prepared curry paste as well as fresh ginger and garlic. These are all spices popular in the Ayurvedic diet, which is well known for its’ health benefits. If you want to make your own curry paste, check out BBC food for the recipe. If you want to learn more about some of the spices used in this dish, check out my post about the health benefits of Indian food. Indian food contains some of the healthiest spices and you should definitely start adding a few of them into your diet! I love that this healthy vegetable curry is a cheap and easy to make, even if you are in a hurry. Eating healthy doesn’t have to take a long time! Use a quick cooking rice. I love brown rice, however, it takes an hour to cook in my steamer. I used a quick cooking rice blend that was done in thirty minutes. If you want to use brown rice, cook it the night before. Then, just heat and serve with your Indian curry. Keep pieces small. As I mentioned previously, dice the sweet potato and carrot fairly small so they cook quickly. For a low fat curry, use light coconut milk. I chose to go with a full fat coconut milk because it does make a richer sauce. Adjust cooking time if needed. If your curry recipe seems a bit too thin, take off the lid of your pot and simmer uncovered for 5 minutes or so to thicken it up. Remember, this sweet potato and chickpea curry is flexible. 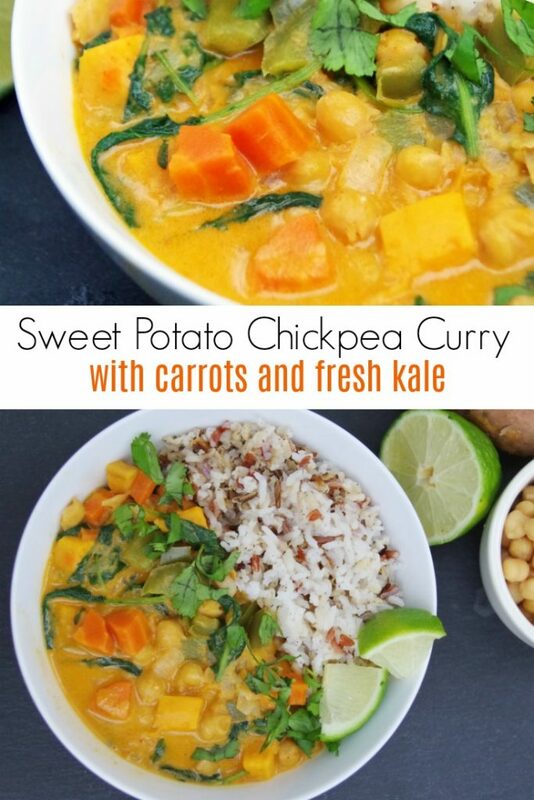 Did you find a sweet potato spinach curry recipe looks good but you don’t have the ingredients? Get creative. 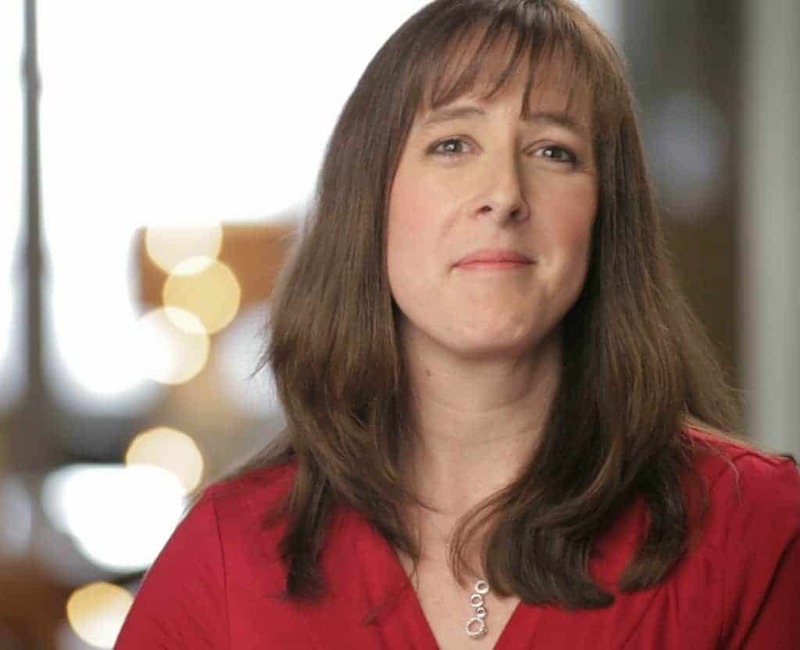 You can substitute white potatoes and kale and it will taste just as delicious! 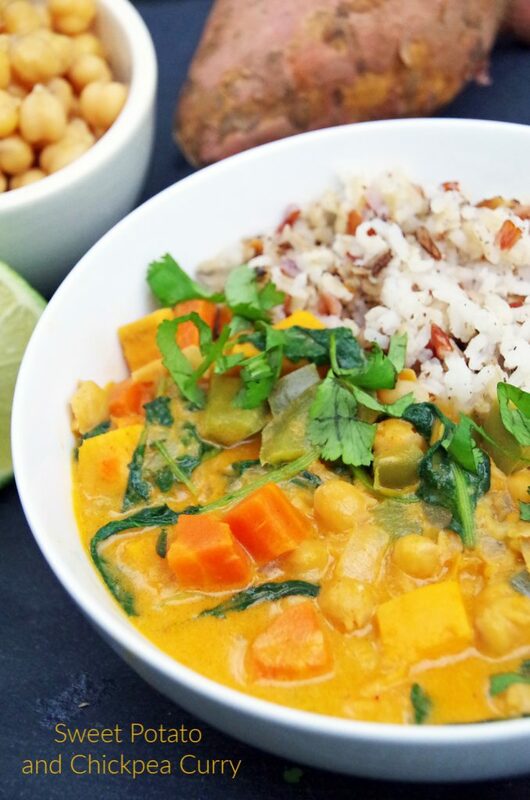 This sweet potato chickpea curry recipe with carrots and fresh kale is loaded with everything you need for a healthy dinner recipe. A warm and hearty vegan curry loaded with flavor! Keep the pantry stocked with sweet potatoes and chickpeas. You can make my sweet potato pancakes or some spicy roasted chickpeas next! 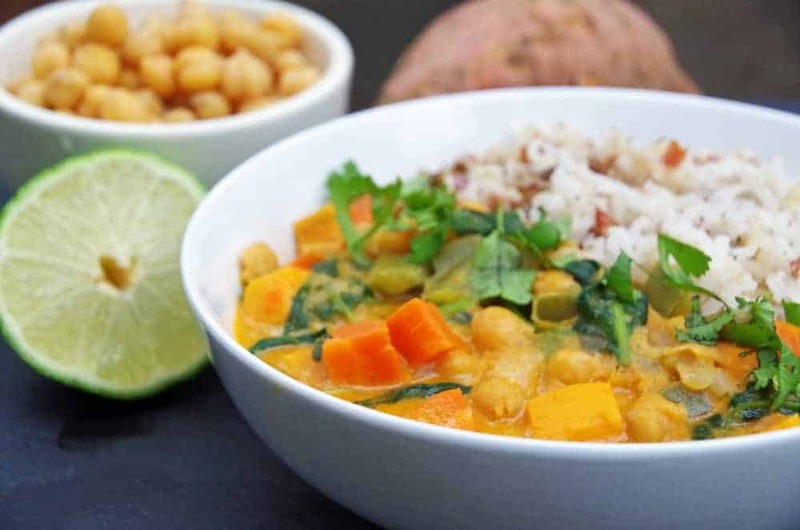 This hearty sweet potato chickpea curry recipe is loaded with chickpeas and plenty of vegetables.Serve it over rice for a delicious vegan dinner recipe. In a medium sized saute pan, heat the olive oil over medium heat. Cook the diced onion over medium high heat, stirring often. Saute 3 to 4 minutes or until slightly translucent. Add the ginger and garlic. Cook another minute. Add in sweet potatoes, carrots, and bell pepper. Cook 2 to 3 minutes while stirring. Add in the coconut milk, water, soy sauce and curry paste. Bring to a simmer and cover. Cook 20 minutes or until vegetables are tender. If sauce is too thin, remove lid and cook 5 more minutes. Sever over cooked rice with cilantro and lime wedges as garnish.